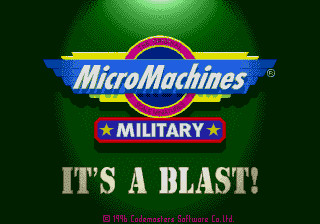 Micro Machines is a lovely little game. The original is better then the sequels due to its simplicity. 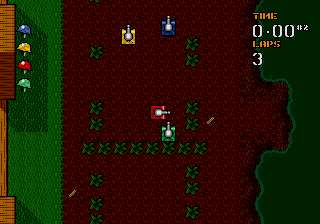 Fantastic party game, race micro machines around giant, real-world 'tracks'. 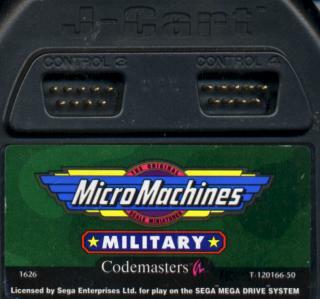 The sequels came on Codemasters brilliant "J-Cart" allowing another 2 joypads to be connected!! Even the Game Gear versions featured 4 PLAYER racing!! This is it folks, gameplay, pure, simple & straight. The j-cart idea is beautiful! And very unique for the sega platform! 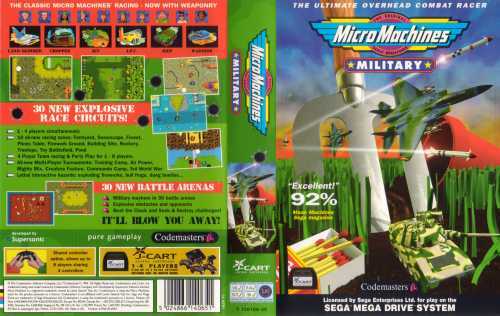 Do all the Micro Machine games work on Genesis? And how can you play 8 player on Turbo Tournament? Oh, I just saw on the scan of the box, you use I controller for 2 people. Oh And I also meant to say that I actually prefere the Genesis version to the Playstation/N64 because the tracks are a lot better designed for repeat playing. They're still so much fun! And the construction Kit in MM96 was brilliant as well. If anyone remembers the British gaming show Bad Influence, then watch for presenter Violet Berlin in MM2!